Listening to Marilyn Wentworth talk about her career in social services, it’s hard to not get a warm, fuzzy feeling. For decades, she worked with those with mental illness and helped them find their place in the world. Now in her retirement years, Marilyn is literally giving people the warm-fuzzies with fleece from her herd of alpacas. It was as a young teen in Columbus, Ohio that Marilyn first learned how one person can make a positive impact. She had a friend who had attempted suicide by overdosing on aspirin. Instead of keeping their daughter away from the troubled teen, Marilyn’s parents took her to visit him in the hospital. “They taught me that you don’t have to have a Ph.D. to do good work,” she recalls. When it came time to go to college, Marilyn chose to study the field of psychology and she opted to do that at Ohio University in Athens. When faced with the choice of Ohio State University in her hometown or OU in the scenic hills of southeast Ohio, Marilyn said it was an easy choice to make. Marilyn didn’t relocate to Athens alone. Her husband (boyfriend at the time) Bruce accompanied her to OU in 1967 studying architecture. They both fell in love with the area and have made it their home ever since. When asked how she met Bruce, Marilyn said, “I saw a cute boy walking down the street and I chased him until he caught me.” The couple has been together since their sophomore year of high school and married in 1972. In 1990, Bruce and Marilyn selected a piece of land on Rock Riffle Road with a beautiful view of the city of Athens to call home. The previous home on the property had burned down and its ruins were removed work could begin on their forever home. 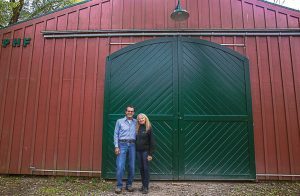 Marilyn and Bruce Wentworth have been together since their sophomore year of high school, married in 1972 and bought the property that is now home to Phoenix Hill Farm in 1990. “It was like a phoenix rising from the ashes,” Marilyn said. The couple gave their homestead the moniker Phoenix Hill Farm. After college, Bruce went to work building homes and Marilyn began working at the Perry County Department of Job and Family Services. Shortly after, Marilyn became a social worker at the Athens Mental Health Center. Part of Marilyn’s job was to help people with mental illness get out of the hospital and integrate back into society. She would pair volunteers with individuals in Athens, Hocking and Vinton counties to help them make the transition. To aid in this mission, Marilyn helped establish The Gathering Place in Athens. The Gathering Place is a nonprofit community support program that promotes recovery for adults coping with mental illness. In short, it is a home in Athens where folks can gather to socialize, participate in recreational activities, art therapy, or even grab a meal and relax. The Gathering Place celebrated its 40th year in 2016 and is still going strong, providing a place of comfort and happiness for many. During her career, Marilyn has also worked with groups such as ATCO (an employment agency in Athens for individuals with developmental disabilities), Planned Parenthood, Kids on Campus and Tri-County Career Center in Nelsonville. She conducted job training for individuals to help them re-enter the workforce. Marilyn taught people about resumé building, interviewing techniques, customer service, and “emotional intelligence.” She describes this last skill set as being able to have empathy and read others’ body language and social cues. “But by far, the best job I ever had was being a mother, and now a grandmother,” Marilyn said. She and Bruce have two sons — now in their 30s — and three grandchildren. Eventually, Marilyn retired to take care of her elderly parents. She said she is thankful that she was able to spend her parents’ last years with them. One of Marilyn’s other lifelong passions is animals. She said she had dogs as a child and loved riding horses. As a young girl, she said she couldn’t wait to have a horse of her own. At the age of 29, that dream became a reality for Marilyn. She has owned 13 horses since and currently residing in one of the barns at Phoenix Hill Farm is Marilyn’s trusty steed Nick. Marilyn has always had a love for riding horses. Over the years, she’s had 13 of them, including Nick, with whom she is pictured here. But what resides in the other barns on the property are a little less common in southeast Ohio: a herd of 12 Suri alpacas. After researching various livestock, Marilyn said she opted for alpacas because they are relatively low maintenance and offer a sustainable product. 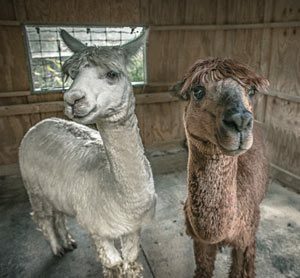 The two distinct breeds of alpacas — Huacaya and Suri. Huacaya alpacas are described as being fluffy like a teddy bear, while Suris have long, shiny curly locks. After comparing the two, Marilyn chose Suris. “I looked at their locks and said, ‘I know how to deal with that!’” she said, pointing to her own tightly wound curls that cascade down past her shoulders. Suri fleece is more rare and is in higher demand. Marilyn said she’s always enjoyed fibers. “I’m a very tactile person,” she said. Once the fiber is sheared from the alpaca, it is referred to as fleece. Compared to wool from sheep, Marilyn said that alpaca fleece is lighter and warmer. There are two distinct breeds of alpacas — Huacaya and Suri. Huacaya alpacas are described as being fluffy like a teddy bear, while Suris have long, shiny curly locks. The alpacas at Phoenix Hill Farm are Suris. “It’s soft and buttery,” she said. After the decision was made to invest in Suri alpacas, Bruce went to work building barns for the new livestock. In 2007, the couple purchased two male alpacas, followed by a female and a baby. Since then, 12 alpacas have been born on the farm. Alpacas typically have one baby — or cria — at a time and the gestation period is around 11 and a half months long. The average lifespan of an alpaca is 20 years. Marilyn’s oldest alpaca Rocco is 17. With their long necks, large eyes, lush lashes and cuddly fiber, alpacas are nothing if not cute. And they each have their own personality. Marilyn knows who wants hugs and who wants to be left alone. She compares their social mannerisms to cats. Some are friendly; some are skittish. If the alpacas get mad at one another, they have a tendency to spit. Marilyn said she’s been caught in the middle of such exchanges a few times. But overall, alpacas are relatively clean animals. And like cats, alpacas are pretty self-reliant. Marilyn makes sure the animals are fed, watered and have their vaccinations. She routinely brushes out their fiber as the alpacas find it fun to roll around on their backs in the dirt. On average, the Suri alpaca fiber grows an average of 6-8 inches a year. Marilyn shears her alpacas each May and the fleece is shipped to an alpaca yarn mill. The fleece is returned to Marilyn in the form of yarn, which she then sells in her home shop. Alpaca fleece has a range of 22 shades from black and brown to bright white. It can also be dyed. Although Marilyn has the capability to crochet and create items from her yarn, she said she prefers to be outdoors with the animals. “I can only sit still for about an hour,” she laughs. She sells her yarn to crafters looking for Ohio-made materials, but also offers a wide range of finished alpaca items imported from Peru. Alpacas are native to the Andes Mountains in southern Peru and have been domesticated in that region for thousands of years. Soon after establishing her herd, Marilyn decided to open up her alpaca farm to the public for educational purposes. Each summer, Marilyn and Bruce host a weekend open house where families can come meet the alpacas like Goldie Fawn and Turbo and their three offspring Rocket, Frida Kahlo and Iris. Marilyn uses this opportunity to teach people about the exotic creatures and their fabulous fiber. “They’re just so cute and fun,” Marilyn said. Marilyn sells her products at the Athens Area Fiber Faire, the holiday bazaar at the Dairy Barn Arts Center in Athens and at the Athens Farmers Market in December. She also offers her products at her home shop, which is open by appointment. For those interested in learning about alpacas, including starting their own farm, Marilyn said she’s always happy to share information about the sustainable livestock. Alpacas at Phoenix Hill Farm is located at 8266 Rock Riffle Road in Athens. For information, visit www.alpacasatphoenixhill.com or call (740) 591-7669.